Alex let out his breath with an astonished, "Whoa", when he saw the huge hole in the ground. It was, of course, the large crater that Miss Vee's spaceship made when she and Rainah escaped the horde of Flies and flew away to Mars. It lay further to the right of where he was peering down from high up on Big Ben's ladder. Black, charred soil was heaped up all around the crater but Alex hadn't seen it before because he had been down below in the winding maze of trails. Now, as he looked down on the wide expanse of the blackened crater, Alex found it difficult to believe how he could have missed it at all. It was at least three hundred yards across and a nearly perfect circle. The bottom of the huge hole could not be seen from where he was though - it was simply too deep. "I have got to go see that", Alex breathed with renewed excitement. This was just what he was needing to give him a new challenge: a mystery. Who could guess what he would find down there, and Alex was certain now that that was where the strange laughter originated as well. Alex took a rough estimation of the direction and distance he would need to take to reach the crater then he climbed down the maintenance ladder and jumped down inside Ben's loading bucket. There he rooted around in an old toolbox where he found a can of spray-paint. Once back on the ground, he took a rough bearing of which direction he should walk from Big Ben to reach the crater; Alex didn't want to get lost again in the confusing maze of trails. Then he started off, spraying the bright orange paint on the ground or on certain scrap-piles so he could blaze a clear path to the crater. Every so often he looked back on his path to make sure he could find his way back as well. It worked perfectly. Only five minutes passed before Alex emerged at last from around a mound of scrap-iron and looked upon the crater itself. It was definitely very wide and very deep. After all, the Biosphere Ship had been buried as deep as possible under ground in order to evade detection by the Others. When it finally did emerge and blast away, the hole it left behind was as big around as the ship itself. A large circle of blackened and churned up soil was left around the outer rim of the crater as well. Of the Others - the Flies - there was no sign; they had all been simply vaporized by the intense heat and shock-waves from the fully activated Dimensional Imbalance Engine. Alex walked up the rim of churned soil and then to the edge of the deep hole itself. The earth inside it sloped gradually down for several paces before finally dropping away and down into the shadowy depths far below. Peering down as far as he dared to, Alex was left in awe of the magnitude of power that had enabled the huge Biosphere Spaceship to burrow up through the tons of rock and soil. Not only that, but to do it all in only a matter of seconds, leaving behind the massive, circular shaft was a feat of unimaginable force. Skittering down the inner slope for a few yards, Alex accidentally scuffed his foot against something hard that had been half buried in the crater's loose, rocky soil. Bending down, he carefully wiped away the dirt and made an unusual find: a rather large chunk of thick green glass. The Glass Tunnels, how could he have forgotten? Then, from somewhere inside the deep, dark hole came that laughter once more, "Ha-haw!" The boyish laughter rose up to Alex, much louder now, yet still with an echo as though from across a wide canyon. At that same moment and without warning, the Luss in the back pocket of Alex's coveralls did something it never had done before: it sang! Snatching the Luss out of his pocket, Alex gazed in wonder at the strange new behaviour of the magical device, which still amazed him with its many qualities each day. The sound it made was not so much singing as it was a high, crystal clear tone which wavered musically up and down the scales. The music or singing that the Luss made was quite beautiful and very alien in nature because it was unlike anything that Alex had ever heard before. But, the laughter ceased after the Luss began singing, as though someone else was listening to it as well; someone down there, in the deep shadows of the crater. "Hello", Alex called. "Hello, are you there?" 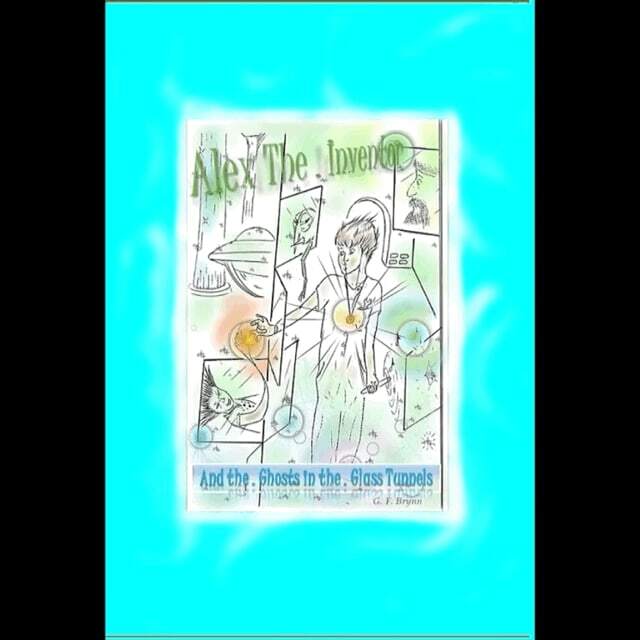 "Alex...where are you", called an all-too-familiar voice. Alex jumped with surprise as the sudden call from his mother broke the stillness around him and ruined the charm of the musical song coming from his Luss. "Yes, mom, it's okay...be quiet...please", Alex called back as quietly as he could. "Alex, can you hear me?" "Yes...it's...all...right!" he growled with frustration. Abruptly, the music stopped and the faraway laughter from within the crater ceased as well. "Oh! Yes...yes...I...can, okay....I can hear you just fine...just won-der-ful-ly!" "Well...okay...time to come home for dinner. Are you coming? Alex?" "Yes...I heard you - I heard you the very first time!" Alex yelled as he emerged from out of the winding trails at a dead run to find his mom waiting in the clearing beside Big Ben. On seeing what a state her son was in, glaring and fuming like a little steam engine, Mrs. Faraway merely said, "Oh...okay then." Alex stomped past her with barely controlled, blustering rage, shoving the now silent Luss back into his pocket as he went. “Mothers...”, he growled under his breath. Without another word, he pulled out the can of spray paint and squirted furiously. "Oh-", his mom gasped, taking a hurried step back for Alex had barely missed spraying her boots as he marked the ground in the grassy clearing with a big orange X. "X marks the spot", he growled to himself. Then with one last, "arrg!" he threw the can to the ground and climbed back inside Big Ben's driver compartment, slamming the iron door with an emphatic clang behind him. "Come on Mr. Rust-bucket, let's get you home", Alex fumed as he fired up old Ben's diesel engine; and this time he did make it home, although just barely. Mrs. Faraway walked ahead of him so Alex wouldn't get lost again and Legs faithfully puttered along behind, retrieving yet more parts as they steadily fell off of old Ben. That the old robot actually clunked and sputtered all the way back to the workshop was, indeed, a minor miracle, for he also ran out of fuel as soon as Alex parked him under the roof. Legs chirruped and clicked sympathetically as he parked himself in his usual place next to his old companion. His rear holding bucket rattled noisily with all the loose parts he had saved from the robot. And, after plugging himself into the wall socket to charge his batteries overnight, Legs even gave old Ben a gentle tap on the arm to reassure himself that his big old pal was nearby once more. Then, the scavenger-bot shut down into sleep mode and rested contentedly once more. He fussed and growled still, even at dinner time - although he did clean all the meat and potatoes from his plate - he was famished after all. Elizabeth sat across from Alex, studying her son from time to time. Finally she could take his odd fussing and grunting no longer. "Okay, son, what's this all about", she sighed. Alex slowed his eating a little but kept his gaze fixed on his empty plate. "Hmph", he just said dismissively. Folding her hands in front of her, patiently, Elizabeth gave it a few more moments, then she said quietly, "Is this about your father, Alex?" A nerve seemed to be touched just then because Alex ceased what he was doing and clenched his free hand on the table. Looking up, he glared at his mom with eyes that barely held back the tears. "Yes...and no", he said back at her. "It's always been about my father (how unusual it was to say that word) that's all my whole life has been about! How smart can I be so I can build this or invent that so that maybe, one day, I can find my father! Well I've had it!" he cried helplessly. "Maybe he'll come home, maybe he won't, I don't know! How am I supposed to know?" "Now...today - tonight, it's not going to be just about my father anymore", he finished, trying harder than ever to control his anger, his sorrow. "Alex -", Elizabeth began with a break in her voice. "No...no! I'm sorry mom, I'm really, really sorry but I want life now - a real life, not a dream…not just a hope. I'm sorry", Alex said again in a small, tired voice. He got up from the table and took his plate to the kitchen sink. There he began running the hot water to wash the dishes. A warm mist of steam came up to the boy's face in an almost comforting way. Blank silence filled the small, clean, white-painted kitchen. When, after a few minutes Elizabeth came over to help with the drying, she saw that Alex had calmed down a little bit. It always helped him to be doing something with his hands. The dishes clattered and clacked gently in the sink and the hot, soapy water felt soothing. Alex quietly passed each dish to his mom and she, in turn, dried and put them each in a cupboard or a drawer. It was a mundane yet pleasant chore that they did together every night after dinner. There was a connection between them during these moments; a rapport which allowed each of them a time of quietness, even while being there together. When they were finishing the last few, Mrs. Faraway calmly said, "Alex, don't give up on him just yet." That was all. Then she gave her son a warm, comforting hug and kissed his small, tired brow. Alex quietly said, "Okay mom", then held on to her for some long moments as well. "Go up to bed, son, get some rest. It's been a tough day", Elizabeth said, giving her boy an affectionate hair-muss. Alex gave her a last tired hug. "Okay", he said once more and this time he had a little smile for her too. "I love you too, sweetie", and Elizabeth gave her boy a smile and a gentle pinch on his nose. Alex yawned a very tired yawn, realizing she was right, the day had definitely caught up with him. Maybe it had just been his tiredness talking then, and frustration. Oh well..., he thought wearily, it all had to come out sometimes. As he left the kitchen and entered the hallway leading to the second-floor stairs, Alex paused by the back door where his dusty boots lay. There he noticed something else placed right beside them. It was the rather thick and dirty chunk of green glass that he had retrieved from the crater a few hours before. Alex was very tired indeed. "I must have brought it in and dropped it there and forgot all about it", he mused to himself. Bringing it upstairs with him, Alex chucked it down on the floor in his bedroom. Something odd seemed to happen to it then, but when Alex looked for it again in the dim light of his room, there it lay, on the floor beside his bed. Strange that he had lost sight of it for a few seconds. Alex was exhausted though and thought nothing else of it as he shook off his clothes. His pajamas were on only a minute after that and without further ado, Alex cozy'd himself gratefully down under the heavy layers of warm old blankets. The days were becoming shorter as autumn moved slowly into winter outside his bedroom window. The stars appeared soon afterward, even though Alex Faraway was not awake to watch them. He had calmly fallen fast asleep long before then. It had been a hard day, yes, but there had also been rewards within the hardships which consoled and brought hope to him, no matter how small. Alex soon dreamed in quiet little pleasant worlds where children born into poverty go to escape, at least for a while, the harsh realities of their life. Professor Strikt arrives at a road-side motel to rest for the night, and the inn-keeper has no clue of the rather unpleasant horror that accompanies the bright-faced man with the tired, magazine smile. G. F. Brynn is a self-taught writer & illustrator whose sci-fi stories weave a rich blend of youthful adventurism with ancient myth-fantasy. The characters move in a world in which the divide between dream and reality is thinly shaded. “One of you motherfuckers better get that light out of my eyes,” I say with my usual grimace.